Everyone was given a number. 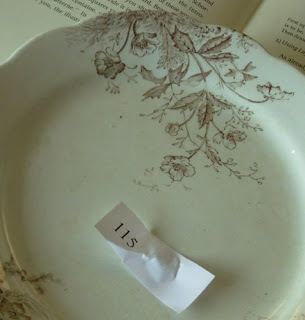 All numbers were added to a bowl. One was drawn out. 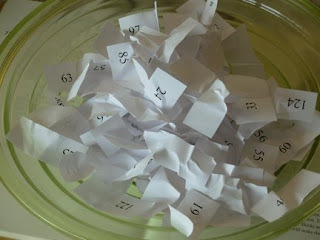 The winner is.....Brenda Petherbridge from Alberta, Canada. Brenda take a look at what Barb and I found for you. The needlecase is old....found at an antique booth in Nantes, France. It looks like a sprig of mistletoe on the needlecase. I thought it was just too cute! 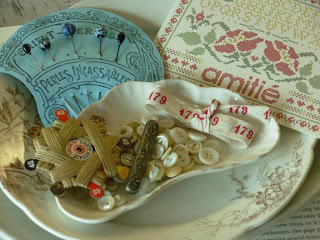 The buttons are from the Paris flea market. 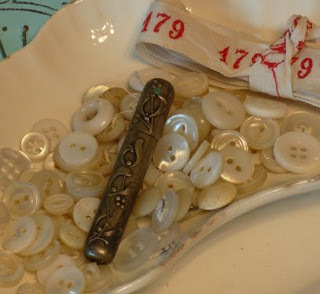 The small tape with the numbers 179 was used to mark children's clothing. The children were sent to school....sometimes a distance away. The numbers were sewn to the clothing as many times the children couldn't go home for a period of time. After the clothing was washed it would be given back to child #179. Brenda, I hope your address just happens to be 179. Well, what can I say? Just thought the tape was really wonderful. It could be great added to a pinkeep. These three lovely patterns were donated by Crown Stitches. The shop owner just happened to be in Nantes at the show and had read about the contest. Isn't she the best? She's from the Netherlands and has a blog too. The small scissors are from Kelmscott Designs. I put in a red pair because Barb lost her's when we accidently left them in our carry-on bag. In France you can't bring scissors on the plane.....so we want you to have a really tiny pair you won't loose when you travel. We had to do a second prize too....there are 7 winners for this. 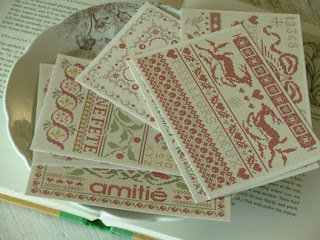 These sweet cards were found in the cross stitch shop in Paris. One for each second place winner. Winners please send your address and I will send out the prizes. Congrats to all! These have got to be the most beautiful prizes I have ever seen! Congratulations to all the winners! Thank you for such a lovely contest! Congrats to the winners! Thanks again for the freebie. Thanks so much for a great contest. Congrats to Brenda & all other second place winners!!! Thanks to Alma and Barb for the contest & the wonderful sampler!!!!! Wonderful prizes. Congratulations to all the winners! 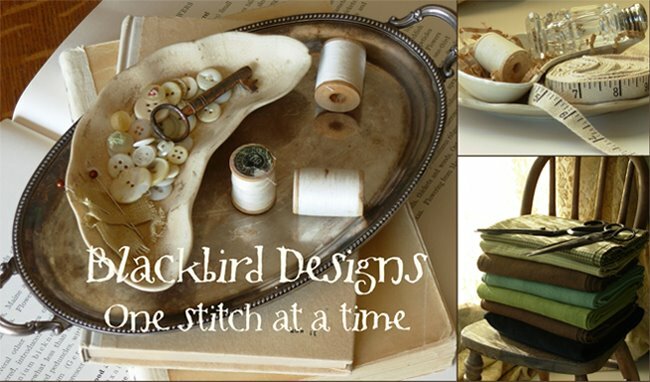 This contest was a lot of fun and resulted in a wonderful stitched piece with a lot of memories attached. Thanks Alma and Barb! What GREAT prizes!!! This contest was a gift in itself! I had sooooo much fun stitching the little sampler and seeing everyone's own version. Thank you again for the little sampler pattern! Those are aweseom prizes!!! I more than a little envious of the winners. ;) Thanks for the lovely design and contest. This was a fun contest and seeing how everyone interpreted the design was really inspiring! Congratulations Brenda! Thank you Alma and Barb! Congratulations to all the winners and thanks again for such a lovely design and fun contest. Congratulations to the winners! A big thank you to Alma and Barb for doing this. 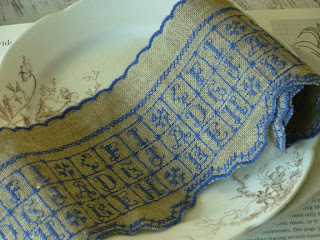 It was a real treat to stitch this sampler and be involved in such a fun contest. I would have been happy with just the buttons. Seeing them made me gasp (maybe I'm being a bit of a drama queen tonight) but I lust. Great prizes! Congratulations to the winners! Congratulations to the winner, Brenda, and the other lucky winners !! I am so happy to have been a part of this fun contest. I have been itching to see how it will turn out for what seemed like an eternity! Thank you Barb and Alma for a wonderful opportunity ! Congrats winners! Can't wait to see their pieces :) Love the prizes. Thanks for the contest Alma and Barb. I want to thank Alma and Barb for this wonderful contest. I am absolutely thrilled to have won all these lovely prizes. My father was born in France and I am so happy to win these great gifts that come from his birthplace. Thank you all so much for the messages of congratulations. I'm glad you were able to enjoy your trip in Paris and Nantes: how many cute things you've found there. Thank you for this contest, it was really fun! Well done Brenda and the other prize winners. I look forward to seeing all the entries in the weeks to come. Congratulations to all of them! The prizes are fantastic and thanks again to you. It's been a pleasure to take part in this contest. Cogratulations to Brenda, and thank you to you for this lovely contest, it was a pleasure to be part of it. Congratulations to the happy winners! These are the loveliest presents you could dream about! And thaks again to Barb and Alma for a wonderful freebie sampler! Congratulation for the winners, I enjoyed this game, really! Super prizes......Congratulations to Brenda and the other seven lucky ladies. Well done Marie :-) . I have enjoyed taking part in this and know my Mum and sister did too :-) Now to look forward to seeing all the samplers entered throughout May ! It was great meeting you in Nantes last week!!! I still think about it a week later!!!! Hope you come back real soon!!!! congrats to all the winners, prizes from Paris how nice. Wonderful prizes! Congratulations to Brenda and the other winners. I look forward to your next contest! Congratulations to all the winners. Great prizes. I enjoyed the contest very much and hope there will be another one. 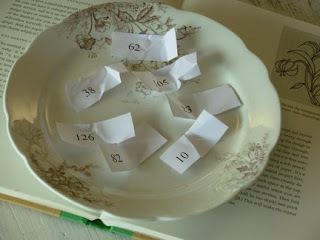 Happy Day for the winners - your prizes were just wonderful - I feel like I won a prize too just receiving this little sampler pattern for free. I really enjoyed stitching it and I think I am going to do three more - one with my mother-in-law's maiden name and one each for both my daughters! Thanks again for your generosity. Congrats to all the winners! Alma, I went to Des Fils et Une Aiguille a couple of months ago, and I can thoroughly picture just how much fun you must have had in there. That was fun. Congrats to all the winners. Everyone's samplers were beautiful and had lovely stories to go with them. I've enjoyed this very much, it was a great idea. what wonderful gifts!! Congrats to Brenda and the other winners! This was a great contest, Barb and Alma! Congratulation to Brenda and to the runners up - and thankyou to Barb and Alma for the great competition, what fun it has been. Woo! Truly fabulous prizes. Congrats to the winners. Thank you for the cute chart! Thank you for such a nice contest! I did not think I would win anything, I just had fun with the stitch! Now I can't wait to see all the pix of all the samplers! Congratulations to the winners. Great prizes and a wonderful contest. One of my very best friends won! Wahoo Marie P!!! Congratulations Brenda, Such a wonderful generous assortment of gifts. I know you will cherish them with the France connection of your Father. Alma and Barb, thank you for your thoughtfulness and all the fun time put in for the prizes. I look forward to seeing more entries in the future. 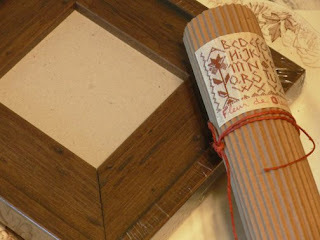 The cross stich chart in the little cardboard tube comes from Françpoise Prax, a very talented a designer who owns an exquisite little shop in my town, Toulouse : http://www.alphabets-toulouse.com/accueil.htm. That's where I buy designs (including yours) and most of threads. Congratulations to all the winners. What great things they will receive. 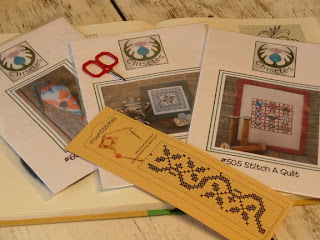 Could you please share a picture of Brenda's stitchery? Would love to see it! Congrats to the winners. This little chart was a price in itself. I loved to stitch it. yesterday I bought a 2nd-hand sewingbox. Now I know what to do with the stiching. I'll place it on this box, it has just the right size for it. Congratulations to all the winners! How special your prizes are! Thank you for a fun contest.